Join us for hot music in the cool, high desert for a weekend of relaxation, comaraderie, and great original music! 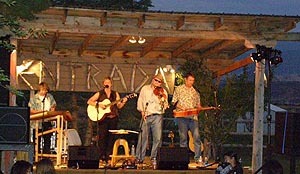 The annual Torrey Cowboy anb Music Festival is on a mid June weekend in beautiful Torrey, Utah. The image above shows The Vapor Trails as they entertain under the Torrey sky. Torrey is located in the south-central part of the state, in the heart of the red-rock canyon country. Named for a colonel in the Spanish-American War, Torrey is in Wayne County, which covers approximately 2,500 square miles of glorious alpine and desert scenery, and only 2,500 inhabitants. Nonetheless, the county has a long history of supporting artists and the arts. Rootsy music will be the order of the day as the Torrey Music Festival kicks off in the high desert environs of Wayne County with an excellent array of Utah musical talent. The Torrey Cowboy & Music Festival is sponsorsed by the non-profit Entrada Institute, and promises to provide memorable melody and harmony. The Robber's Roost Bookstore Stage in Torrey is the perfect venue, with the rugged outline of Boulder Mountain and gnarled redrock cliffs providing an inspirational backdrop. Ancient cottonwoods provide cooling shade on the festival grounds. Food, refreshments, handmade crafts and jewelry, and other festival goods, including a selection of vintage guitars and other instruments, will be on display from local and regional vendors. Camping and motels are available within walking distance and late-night jamming in nearby Teasdale will provide a satisfying finish to the event. At 7,000 feet elevation, Junet is a wonderful time to visit Torrey. The days are warm and sunny, and the evenings are pleasantly cool. 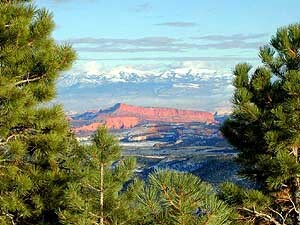 The festival is only a stone's throw away from Capitol Reef National Park. Torrey and the surrounding towns feature fine restaurants and accommodations (motels, B&Bs, campgrounds, cabins and RV parks). So bring your cameras and hiking shoes. Come prepared to experience a weekend of exciting, original music in intimate outdoor settings. Read the article from TheSpectrum.com about 2006 fesitval. Entrada Institute. All rights reserved.2014.